Wedding day holds a very special place in one's life; it ought to be just perfect. But for a reminder, here perfection requires extensive planning. You cannot just randomly select dates and location and presume everything to go the way you imagined. There are a number of aspects that need to be carefully planned before execution so that your special day truly remains special in every sense. 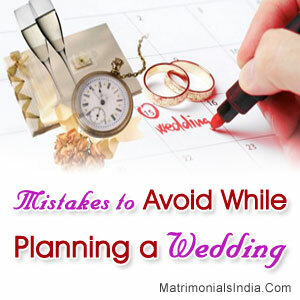 Here is a list of few common mistakes that couples tend to make while planning their wedding. Familiarity with these goof-ups will keep you on safer side when you are set to tie the knot. Once you get engaged never ever set the wedding date in excitement and hurry; doing so may turn out to be a big mistake. For example, if the date you decide falls in the most popular wedding season of the year, you may end up inflating your budget and there will be great chances of you not getting your dream location. So first plan your budget, do your homework and then decide a date. If you are not giving yourself substantial gap of time between wedding ceremony and reception, it can mess up the things especially your wedding album where you will look stressed out, miserable and exhausted. Never hire amateurs to perform on your wedding day; by no means can they deliver a professional performance, and in the end you may just be fretting over your own decision. Leaving the ceremony arrangements to be decided at last is another gaffe. For example, you will never like to book an "average" venue only because you didn't book the one you desired at the right time. Not giving due respect to weather is also a mistake. While planning, take weather considerations into account so that there is no spoilsport in your party. Well, if we go on talking about probable mistakes while planning a wedding, no space will be enough to mention all of them. However, the aforementioned goof-ups are the most common ones, and an acquaintance with them will help you be on the right end on one of your most special days in life.